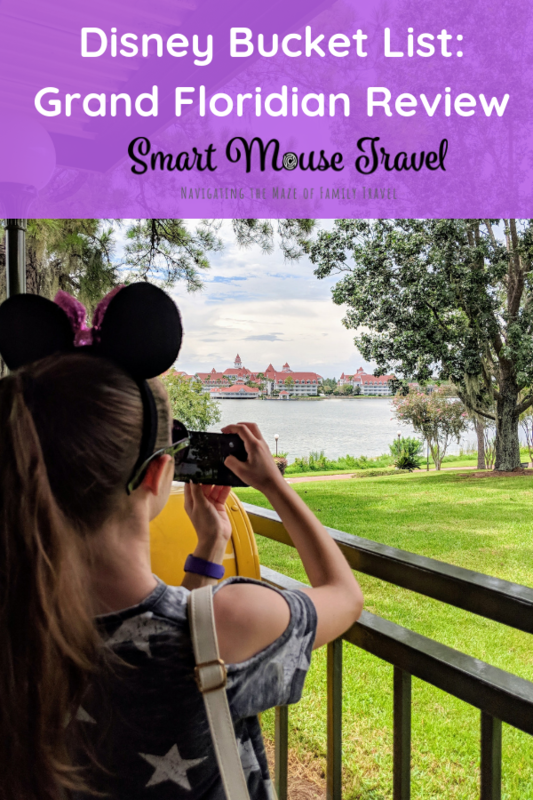 Disney World’s Grand Floridian Resort has been on our Disney World bucket list for a very long time. We’ve had meals and stopped to visit Grand Floridian many times to admire the elegance of this unique resort and dream about staying there. When I finally found an Annual Passholder room discount for Grand Floridian I immediately booked it. Would Disney’s Grand Floridian Resort be able to live up to my high expectations? Grand Floridian is considered a Magic Kingdom area resort. Disney World’s Grand Floridian Resort is a sophisticated Victorian-era-inspired luxury resort. When you enter the large, high-ceiling lobby you are often greeted by live music. Almost every time we were in the Grand Floridian main building after 3 pm, there was either the Grand Floridian Society Orchestra or a pianist playing classic Disney music. The Grand Floridian is split into a main building, outer buildings, and the Villas at Disney’s Grand Floridian. The main building holds gift shops, the Monorail station, the concierge, check-in, and bell services desks, and most of the dining options. There are beautiful curved walkways connecting the different buildings that make up Disney’s Grand Floridian. While walking around the resort, make sure to admire the view of Disney’s Polynesian Resort or Cinderella’s Castle from the Grand Floridian grounds. There is Disney theming throughout Disney’s Grand Floridian, but in a much more subtle way than places like Art of Animation or Pop Century. When we entered the lobby I immediately noticed the inlaid tile floor with a beautiful scroll pattern. What I didn’t see is that Pluto, Donald, Goofy, Mickey, and Minnie are all hidden in the pattern until Elizabeth pointed it out to me. There are two pools at Disney’s Grand Floridian Resort: the Beach Pool and the Courtyard Pool. 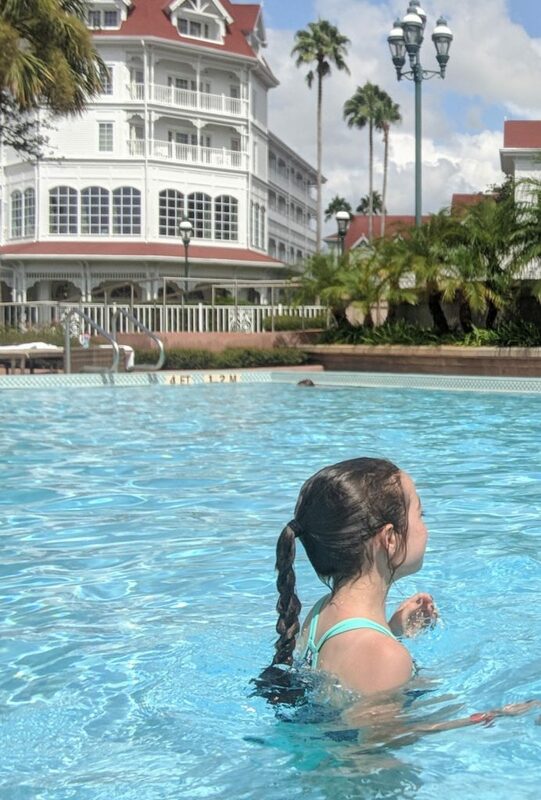 The Beach Pool is the larger pool at Grand Floridian with cabanas for rent, an immense Alice in Wonderland themed children’s play area, and a water slide. Although this pool looked quite lovely we opted to spend our time at the Courtyard Pool. The Courtyard Pool had fewer people and was conveniently located right outside of our hotel room out building. We spent several hours splashing around and playing in the Courtyard Pool and even ordered a poolside lunch. I was pleasantly surprised that the cast member was able to help with Elizabeth’s food allergy and loved the convenience of someone bringing our simple lunch to us. Some of the finest dining at Disney World is found at Grand Floridian Resort, but there are more casual options too. I’ve included a quick overview of each restaurant, but check here to find out even more about Grand Floridian dining. The Garden View Tea Room serves a traditional afternoon tea 7 days a week. There is also a very posh character tea that takes place in the mornings where your child will be treated like a prince or princess. 1900 Park Fare has several character meal options throughout the day. Each day starts with a Supercalifragilistic Breakfast, then a Wonderland themed tea party in the afternoon before switching to Cinderella’s Happily Ever After Dinner in the evening. Cítricos is a Mediterranean-inspired fine dining restaurant at Grand Floridian Resort. Please note that Cítricos has a dress code. The most casual food option (other than the pool bars or restaurants) is Gasparilla Island Grill. Gasparilla Island Grill is a quick service restaurant serving breakfast, lunch, dinner, late-night dining, and snacks daily. The Grand Floridian Cafe is a table service restaurant serving breakfast, lunch, and dinner daily. A step up from quick service our food was delicious, and I was able to enjoy a glass of wine with dinner. This upscale bar is located just behind the bandstand on the second floor of the Grand Floridian lobby. Cocktails and small plates are available after 1pm. Another fine dining option at Disney’s Grand Floridian is Narcoossee’s. This restaurant overlooks the lagoon and has a menu focusing on steak and seafood options. Please note Narcoossee’s also has a dress code. The most elegant of all dining options at Disney’s Grand Floridian, Victoria & Albert’s has been awarded both the AAA Five Diamond Award and the 2018 Forbes Travel Guide Five-Star Award. Please note that Victoria & Albert’s does not allow anyone under the age of 10 years old and has a very strict dress code. It was a short walk past the Courtyard Pool to reach our building. When we entered the lobby of our small outbuilding the smell of fresh flowers greeted us. Elizabeth immediately wanted to look at the incredible flower arrangement in the center of the main floor seating area. Our room was on the top floor of the building, and as soon as we entered the room I fell in love with the Grand Floridian even more. Our room had high ceilings and a gorgeous view over a courtyard. The entrance hallway separated the closet with a safe on one side from the bathroom area on the other. The bathroom area was split into a dual vanity and the shower/toilet area. Although the sink area did not have a door to close it off from the rest of the room, it was not visible from the bedroom area. This meant I could get up before Elizabeth and not wake her while I was getting ready. The shower was standard but nice. The toilet and shower area was a little small, but we didn’t feel cramped. 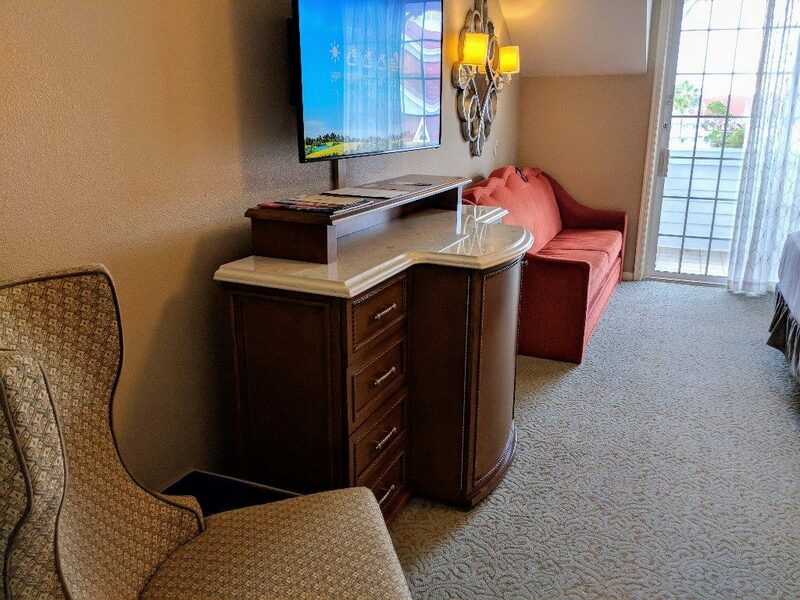 There were definitely some special luxury touches in our Disney’s Grand Floridian garden view room. 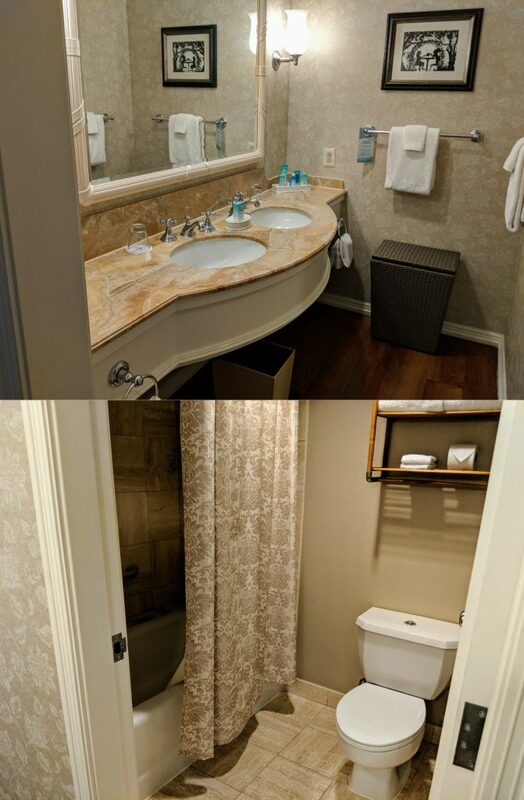 Some of our favorites were the aloe vera burn gel (in addition to the usual toiletries), the first tissue in the box stamped with the Grand Floridian logo, and a hamper for our used towels instead of tossing them on the floor. 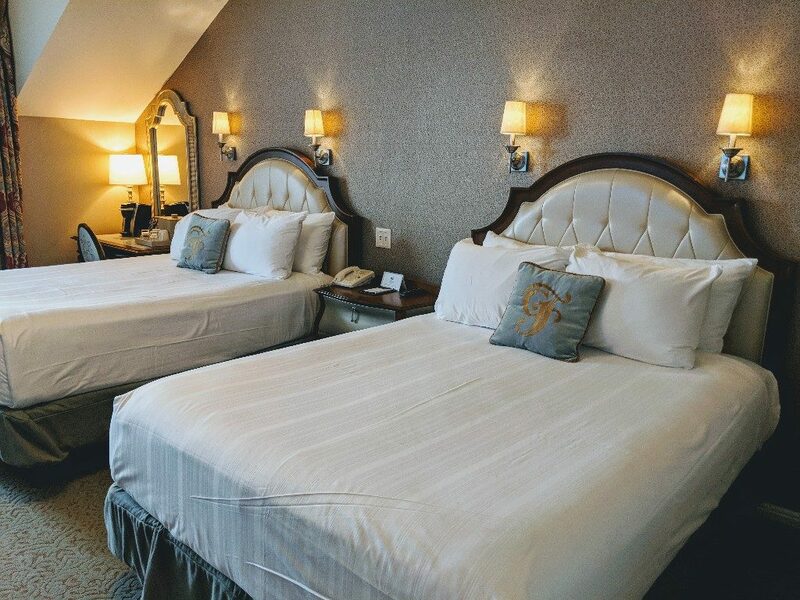 Our room had 2 queen beds and a couch that turned into a twin-size daybed. There was a large dresser that held our mini-fridge and several drawers for our belongings. A desk and chair completed the room. We used the mini rolling desk (found under the large desk) to eat breakfast each morning. One of my favorite features of our outer building garden view room was the beautiful balcony overlooking the Courtyard Pool. This balcony at Disney’s Grand Floridian Resort was the most private of any deluxe resort balcony we have ever had. If the weather had been a little cooler we could have spent tons of time out there admiring the views. Free WiFi is available for Disney’s Grand Floridian resort guests at no charge. Disney’s free WiFi works well for checking email or social media accounts, but not for things like streaming video. Registered guests of Disney’s Grand Floridian Resort pay $24 per night for self-parking. Valet parking costs $33 per night for hotel guests. 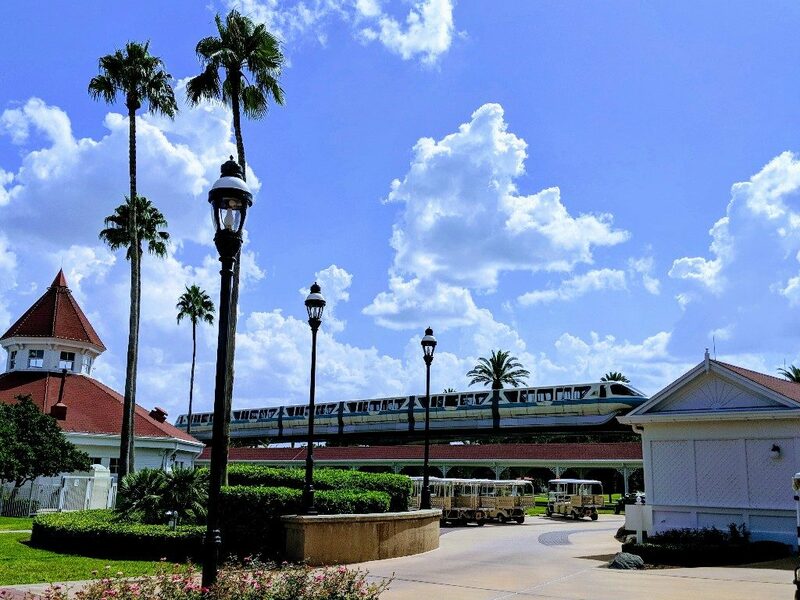 The Monorail is the best way to reach the Magic Kingdom from Disney’s Grand Floridian Resort. The Grand Floridian Monorail stop is located outside on the second floor of the main building. Magic Kingdom is the first stop after the Grand Floridian. On the return trip the Monorail loop stops at Disney’s Contemporary Resort, the Transportation and Ticket Center, and Disney’s Polynesian Resort before arriving back at Grand Floridian. There is also a small boat shuttle between Magic Kingdom and Grand Floridian, but we find the Monorail is almost always faster. Take the Monorail from Grand Floridian to the Transportation and Ticket Center (TTC). Exit the Monorail at the TTC and follow signs to transfer to the Epcot Monorail line. Disney World buses provide transportation from Disney’s Grand Floridian to everywhere other than Epcot and Magic Kingdom. The bus stop is located to the right side of the main building once you exit the front doors of Grand Floridian Resort. Disney’s Grand Floridian Resort has a reputation for being one of the most luxurious on-site Disney World hotels. We have always enjoyed the ambiance of Grand Floridian when visiting at Christmastime or for dining reservations. 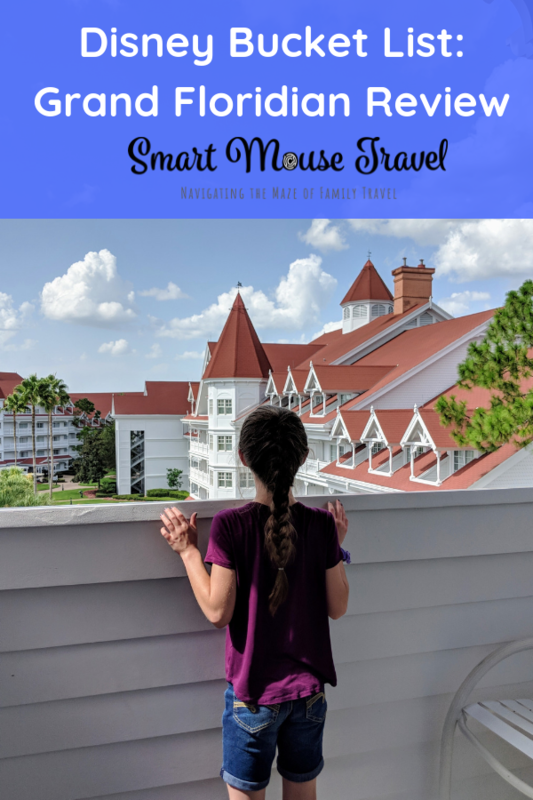 I was curious how different staying at Grand Floridian would be versus our other deluxe resort experiences. Overall, the styling and ambiance of Disney’s Grand Floridian Resort was spectacular. Every cast member interaction we had was fabulous, and people seemed to especially go out of their way to make our stay special. 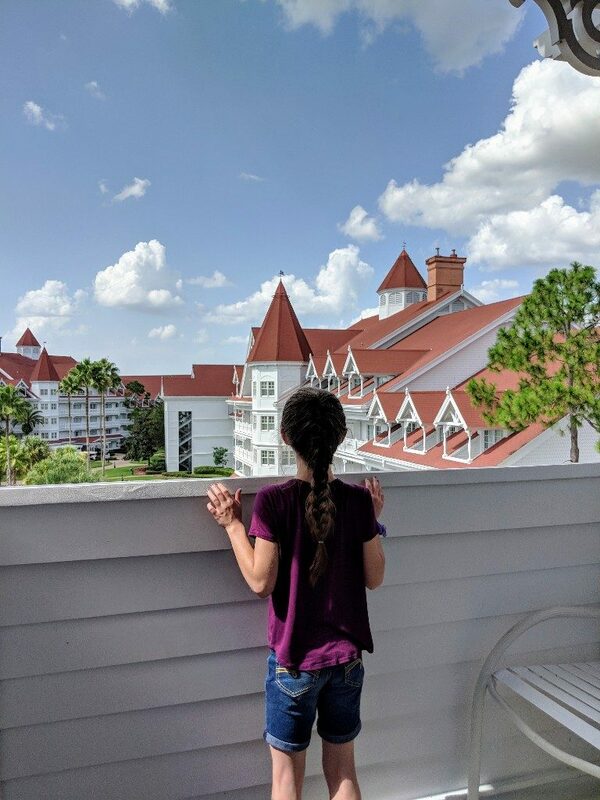 We loved our room and our private balcony at Disney’s Grand Floridian. I would absolutely stay here again if I could find a discounted room. 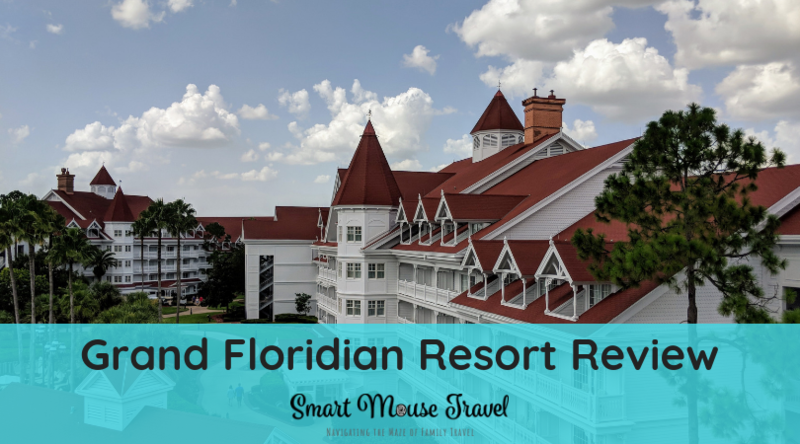 We felt that Disney’s Grand Floridian Resort was a step up from other deluxe on-site resorts at Disney World. However, I would not advise you to go over budget to stay at Grand Floridian. There are many Disney World on-site resort options that can work for a variety of budgets. 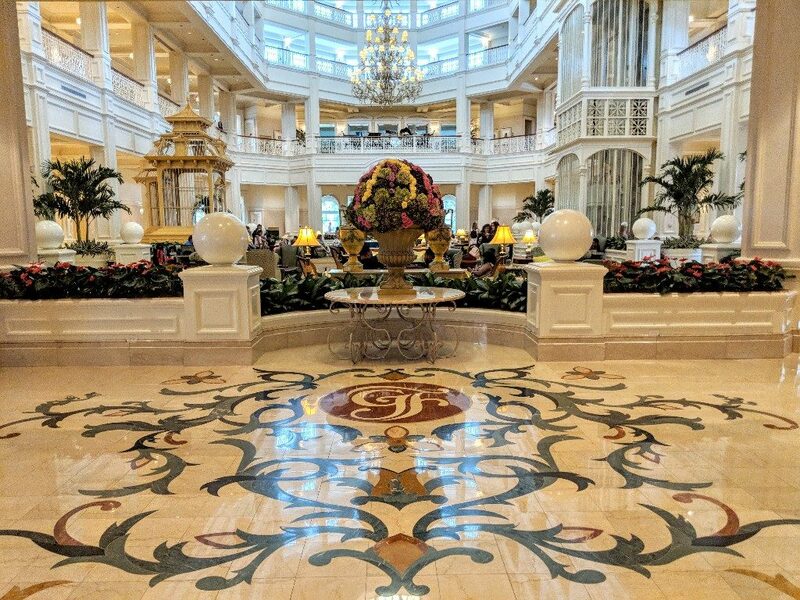 If you want to experience some of Disney’s Grand Floridian opulence without the expense of a room, then I recommend make dining reservations at one of the restaurants or even stopping by for part of a day.